It was the early 90's - seemingly out of nowhere, a little grunge band called NIRVANA began outselling massive commercial artists like Michael Jackson. This immediately caught the attention of the giant record companies. These small underground bands branded as 'alternative' or 'post-punk', went from being inconsequential to being potential behemoths in record sales - and the hunt began. Hungrily sweeping for the next NIRVANA, a buying frenzy ensued as small indie labels were bought out by the commercial labels on a never before seen scale. A&R execs would see random alt-rock bands perform in a bar and appear after their set offering unheard of financial offers and immediate global exposure. It seemed these band members were set for life - so what happened? Verity is revealed in UNDERGROUND INC.: The Unsung Story Of Alternative Rock, an upcoming documentary destined to be the ultimate look at the alternative punk and metal scene in the 90's, and a must see for serious music lovers. Told by the artists who pioneered a sonic subculture, this feature-length documentary tells the real story of the 90's - exposing viewers to an amazing catalog of the era's rarities and buried treasures, while re-living the struggles, triumphs and tragedies, as well as the debauchery. UNDERGROUND INC. will dig beneath the manufactured truth to explore what really happened, exploring a time unlike any other in the music industry! 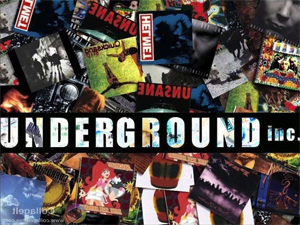 UNDERGROUND INC. features interviews with members of seminal 90's rock, punk and metal groups such as WHITE ZOMBIE, QUEENS OF THE STONE AGE, PRIMUS, BAD RELIGION, STONE SOUR, CLUTCH, RED FANG, FAILURE, MINISTRY, QUICKSAND, HELMET, STEVE ALBINI, SEPULTURA and dozens more. Viewers are getting an in-depth, raw look at the scene from musicians who were at the forefront. Watch the official documentary trailer below. UNDERGROUND INC.'s original music is composed by Peter Mengede (HELMET), Grammy nominated record producer Alex Newport (THE MARS VOLTA, BLOC PARTY, DEATH CAB FOR CUTIE) and Mark Bradridge. You can support the documentary HERE. Exclusive rock prints by international art photographer Ken Schles... and much more! Via their Kickstarter campaign, the UNDERGROUND INC. team states, "This team of professional filmmakers is highly passionate about their music. We are obsessively committed to delivering a mind blowing film, but some practical challenges still remain. Let's make this happen for the artists. For the fans, for the uninitiated, for the generations to come that will be able to be inspired by this until now untold history of some of the greatest music ever amplified on the planet Earth." Read the full statement via the Kickstarter link above. UNDERGROUND INC. is directed by award-winning Writer/Director Shaun Katz (Sleeping In Blood City). Having produced many music videos and short films, his most recent short film won four international and local awards throughout Australia and North America, including Best Short Film at the Las Vegas Film Festival and Best Director at the Canada International Film Festival, among others. His work has been featured at festivals worldwide, including Cannes Film Festival.